Alamance County, North Carolina, Take This Survey! If you live in Alamance County, North Carolina, here’s your chance to share your Internet access experiences with your county leaders. The county asks that as many residents as possible take a few moments to complete their Internet Speed Survey. As the realization spreads that FCC data on where broadband is available is deeply flawed, local communities such as Alamance County are asking their residents to supply that data directly for a more accurate picture. The survey is quick and simple, consisting of only four questions relating to the type of Internet access, speed, and how much folks would be willing to pay for high-quality connectivity. Residents can access the survey online, but a paper version also went to property owners along with their property tax bills in July. The county Tax Office and all libraries in the county have paper copies that residents can complete and submit. The county is considered part of the Greensboro-Winston-Salem-High Point Combined statistical area, sitting directly east of and adjacent to Guilford County. Within Alamance County, the city of Graham is the county seat. Approximately 159,000 people live in the county, the bulk of which reside in the three largest towns of Burlington, Graham, and Mebane. Beyond the three cities, many of the communities in Alamance County are small, rural towns. Most rural communities in the county contain fewer than 1,500 residents. In as little as 18 months, the newly formed Pacific Rural Gas Cooperative (PRGC) plans to deliver natural gas and broadband to Spring Creek, Nevada, and to neighboring Lamoille shortly after. Nestled at the base of the Ruby Mountains in northeastern Nevada, Spring Creek is a small town of about 12,300 people that originally formed in the 1970s as three large housing sections. The municipality mainly serves as a bedroom community for businesses and industries in the nearby City of Elko. The economy is mostly based on gold mining, with limited ranching, tourism, and manufacturing also providing jobs. Former Nevada governor, Jim Gibbons, who now owns a 40-acre ranch in Lamoille and Tariq Ahmad of Satview Broadband Ltd. founded the co-op in order to serve the 57-square-mile-area in Elko County where those services still do not exist. Nevada prohibits municipalities with populations greater than 25,000 and counties greater than 50,000 from offering telecommunications services, but small municipalities and co-ops have been stepping up to provide broadband to rural areas. Last year, Churchill County Communications (CC Communications) began partnering with the Valley Communications Association of Pahrump (VCA) and Switch technology to bring fiber to rural areas of southern Nevada along US Highway 95. Despite the recent progress in other areas of the state, Spring Creek and Lamoille still need the services PRGC can bring to their communities. 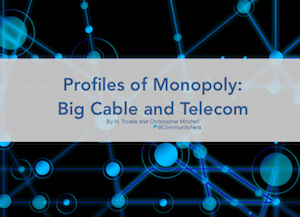 Like many other rural communities, large national ISPs have resisted investing in infrastructure needed to offer high-quality connectivity. While JAB Wireless advertises broadband in the area, the company only provides terrestrial fixed wireless, a service often requires line of sight access between a ground station and subscriber. Beehive Telephone Companies, the only other provider of broadband in the area, brings Fiber-to-the-Home (FTTH) to less than one percent of census blocks in Spring Creek and Lamoille.